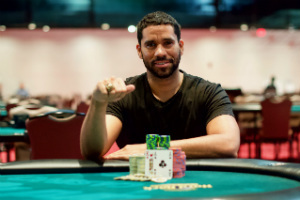 Dominique Mosley, originally from North Carolina but currently residing in Florida, won the highest buy-in event on the schedule of the WSOP Circuit Seminole Casino Coconut Creek stop. The player snatched his first gold ring from the series and a first-place payout of $75,480 for winning the $3,250 High Roller. The tournament drew 74 entries. The field included local recreational players, traveling grinders from here and there, and poker professionals, including Mosley himself. The overall prize pool of $222,000 was split into payouts for the top eight finishers. The tournament was played over two days. The second day kicked off with nine players who were just a single elimination away from the money bubble. Mosley was third in chips at the time cards were thrown in the air for Day 2 play. Maurice Costigan,who won his seat into the event via a satellite, and Martin Ryan, who vied for WSOP Circuit gold ring number six, were the only two players ahead of the eventual winner at that time. Costigan went out in seventh place and Ryan fell in fourth. What turned out to be Mosley’s most important hand was dealt namely during four-handed play. The player confronted Mike Dwyer in that pivotal hand to eventually win it. Mosley assumed the chip lead shortly after and never looked back. The 31-year-old poker pro played heads-up against Matt Stout. The two-handed duel lasted several hands, during which Mosley left his final opponent with no chance to improve. On what turned out to be the last hand in play, Mosley limped in on the button and Stout raised. Mosley three-bet and Stout shoved for his last 700,000. Mosley snap-called and tabled [Ac][Kh] to Stout’s [Ad][Jc]. The board ran out [6c][3s][2d][5h][7s], securing the pot and the title for Mosley. His opponent received $46,702 for his deep run in the event. Mosley has been playing poker professionally for some time now. The player currently lives in South Florida to take advantage of the region’s thriving poker scene. Commenting on his poker preferences, he said that he prefers playing Pot-Limit Omaha to two-card formats. “A Pot-Limit Omaha specialist”, he would call himself. However, the player does not lack skills in two-card games, as well. Mosley’s cash from the $3,250 High Roller was his second from the WSOP Circuit series. He also previously cashed in eight WSOP events. His overall winnings from both series currently amount to more than $229,094. The WSOP Circuit Seminole Casino Coconut Creek stop is entering its final days. Day 2 of the $1,675 Main Event is set to be played today when players will set the official final table. Nine-handed action will resume tomorrow when the winner will be determined to mark the end of the WSOP Circuit’s Florida stop. The tournament featured a guaranteed prize pool of $1 million which was improved significantly due to great interest. A prize pool of $1,240,500 will be split among the top 90 finishers. The winner will receive nearly $242,000 for their efforts. The post Dominique Mosley Wins WSOP Circuit Seminole Casino Coconut Creek $3,250 High Roller appeared first on Casino News Daily.